The other day in a painting class, someone asked me what the difference is between all the blacks that are available — Bone Black, Mars Black, Payne’s Gray, Ivory Black, Carbon Black, Ebony Black… When you squeeze out dabs of the different blacks on a surface, they really look quite similar. A few differences start to emerge once you start trying to use the paint on the canvas, because you are thinning it a bit as you spread it. Now, they might show themselves to be more transparent or more opaque; some will seem a little less dark and some will hold that sense of being very very dark; the color might appear to lean a little more toward a warm kind of blackness or more towards cool (think chocolate-black versus blue-black). One of the places it’s easier to see the difference between blacks, though, is when you mix them with other colors. Mix 5 different blacks with white and you will get 5 pretty different grays — which you could use as is or mix with a tiny bit of purple or green to get a lovely shadowy color to use on a face or a sidewalk or a tablecloth. When you mix the blacks with other colors on your palette, you realize that they behave more like a very deep but neutralized color themselves. Add a little yellow to Ivory Black to get an earthy green; add a cool red to Payne’s Gray to get a deep purple; add bright red to Mars Black to get a warm brown. Learning how to think about and use black usually begins with an effort to paint a shadow or darken a portion of an object. How many times did I think, I’ll just darken this red with a little black, only to have the color really fail? The black paint acts as its own color with its own characteristics — and not as the darkening filter we intuitively expect. In fact, most professional painters don’t buy black paint. They argue: how often do we see something truly black in nature? If we look at the darkest of darks in our world, they are usually dark browns — say, in the shadowed crevice of a tree trunk — or dark greens — the shadow of a tree on grass— or dark gray — the most burnt part of a stick of wood. So, when they want a something very dark on the canvas, most painters will just mix up a very dark color and use that instead (say a dark blue, green and red). So, how to paint that shadow? Ah, one of my biggest challenges! But, to paint the shadow, we have to look at the object and identify not the phenomenon of the shadow, but the color of the shadow – which is the color of the thing in the spot where the shadow is falling. 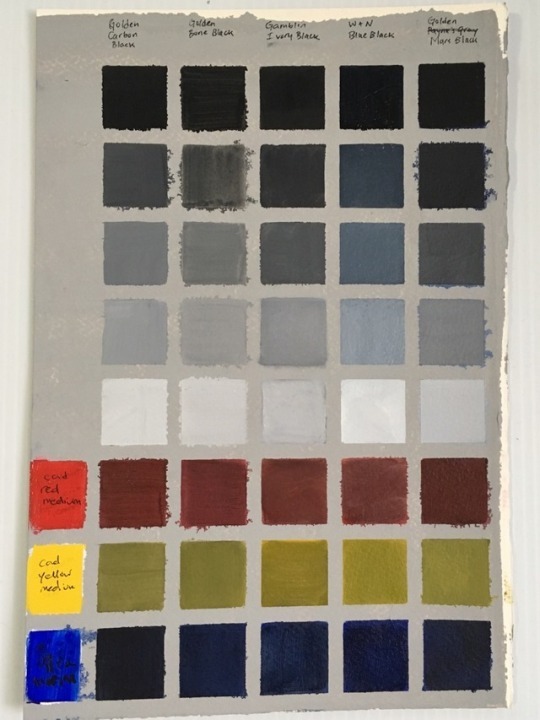 It will probably be a mix of all the primaries (and probably not as dark in value as a black) and the challenge is to find a mix that will sit right in the painting both color-wise and value-wise. If you’ve got “black” on your palette, it’s okay to use it to make this color, but think of it in terms of adding a very dark blue or a very dark green as you add it sparingly to your other pigments, then adjust accordingly with the addition of other colors too!